In 28 days I will have written 3000 blogs. Many are of considerable length, all but a few with my photographs. Some are guest written. John Lekich and Les Wiseman are two that have. Tonight I want to reflect on this milestone of mine. The question is a valid one as few who are on facebook ever go to a particular person’s page but only follow the postings they might notice. Had my friend gone to my actual blog (skipping the link through Twitter (@alexwh or the facebook one) he would have noticed that I have a blog for every day. But people now do not really use RSS feeds they use facebook or Twitter as easy portals. My regurgitated blogs are really random picks of mine as few are really able to navigate my almost 3000 blogs. You can use Google. As an example, alex waterhouse-hayward, malibu will connect you to quite a few varied blogs related to my car. Raymond Chandler after a comma and my name or the same for Emily Dickinson will lead to to perhaps interesting encounters with pictures that go with the writing of those two Americans. I have further noticed that many even today see my facebook link postings to my blog and get to click that like button about liking your photograph. Some of them still do not understand that there is a link to the blog and the written part. People who should know better will see a photograph of P.D. James (identified as such in the body of my blog) and ask, “Is that P.D. James?” Obviously they are too busy to read. In this new social media/writing platform called Medium.com to which I write a few new but mostly retread or re-modified blogs, they have an innovation which is that every essay has the estimated reading time in minutes. 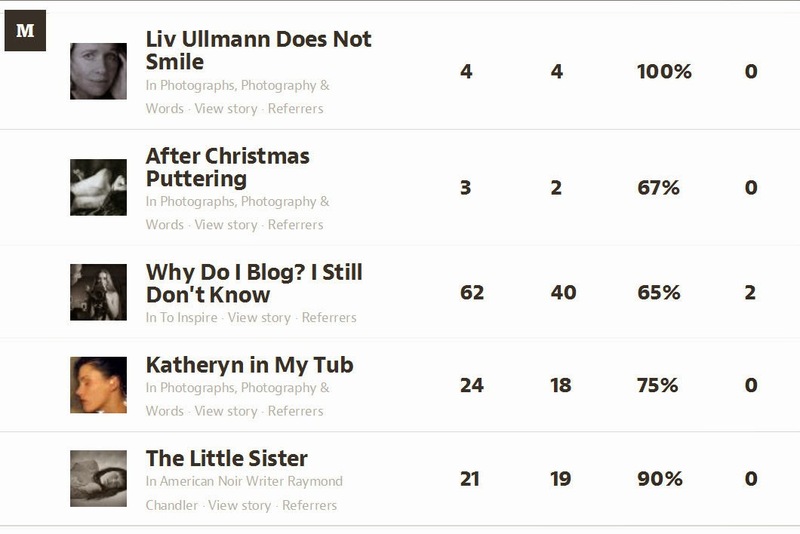 Medium.com’s statistics divide you essays into views and reads and then follow that with a read ratio in %. The statistics of my Blogger tell me that I have an average of 350,000 page views per month. But if Blogger statistics incorporated Medium’s those so-called page views could be perhaps 50% smaller. Many who write essays for Medium stress that the purpose of a blog is to instruct others. I would challenge that. I see that many of my blogs may be seen (and perhaps not read at all) by few so I would be deluding myself in thinking that I am writing these and this to instruct. I think that a blog is much like a Shakespearean soliloquy in which I put down on a monitor screen my thoughts and I am too old and too modern to begin every day with Dear Diary. My basement photo files which are all in alphabetical order and some drawers are by themes like writers, travel, family, have ordered in my head my photographic output through the years. My blog has helped me in this as the pictures here, well over 3000, do manifest not only part of that photographic production but also an interweaving of my thoughts on books I have read, people I have met and interacted with plus lots of stuff of my own life which my family, and particular my two daughters enjoy reading. My blog is useful to me and to a few that are close to me. If others find utility that is up to them. If they do not I cannot be damned for the failure as it is not my intent to educate or instruct.